Puréed white beans lend a little more boldness and depth of flavour than one would ordinarily find in a cream of asparagus soup, but at the same time take nothing away from the simplicity and elegance of this summer classic. Best of all, the added nourishment means that this doesn't have to be just a starter soup but can be served as a delightful light summer lunch by itself. Rinse the beans and soak overnight covered in several inches of cold water with a little yogurt whey or lemon juice added. Drain and rinse, then add to a medium saucepan, pour in 3 cups of fresh water and the vegetable stock, and bring to a boil. 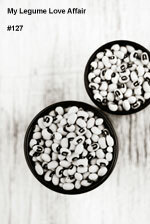 Immediately reduce the heat to low, cover, and let simmer for 1 to 1 1/2 hours or until the beans are soft. Meanwhile, snap off the woody ends of the asparagus, chop into rough pieces, and set aside. Once the beans are cooked, heat the butter or oil in a large saucepan or soup pot over medium heat. Add the onion and cook until soft, about 10 minutes. Toss in the asparagus, stir once, then add the parsley and lemon zest. Pour in the beans along with their broth and the lemon juice. Bring to a boil, then reduce the heat to low and simmer until the asparagus is tender, about 5 minutes. Using tongs, remove a handful of the asparagus tips and set aside. Purée the soup with a hand blender or in a countertop blender until smooth. Season with salt and plenty of fresh ground black pepper. 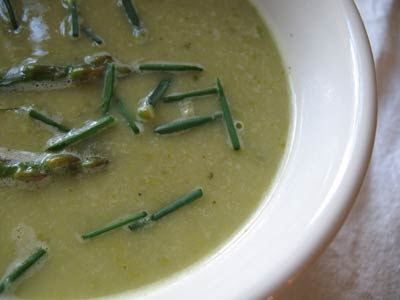 Serve hot or warm garnished with the asparagus tips and a sprinkling of fresh chopped chives. sounds delicious - I will be saving this idea for spring when asparagus is in season! This recipe sounds awesome and your soup looks scrumptious! Such a nice color too. The soup looks so creamy and yummm...rains are here and it seems a perfect time for soups!! Beautiful recipe and snaps to match it!! I love asparagus, the only problem they are hard to find. The soup sounds perfect. The pureed beans add thickness to the soup,Looks delicious. Lovely clicks. Wow looks so good! What a healthy soup with beans n asparagus! Thats a real healthy soup...will give a try sometime..
Lovely and hearty soup. I'll be keeping white beans in mind when I make asparagus soup next time. My daughter loooves anything and everything with asparagus. 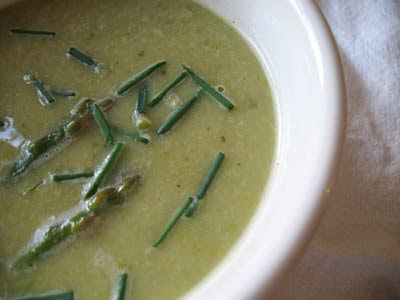 I like the addition of beans to the asparagus in this soup- makes it wholesome, hearty and filling. Mmm I love white beans in soup! 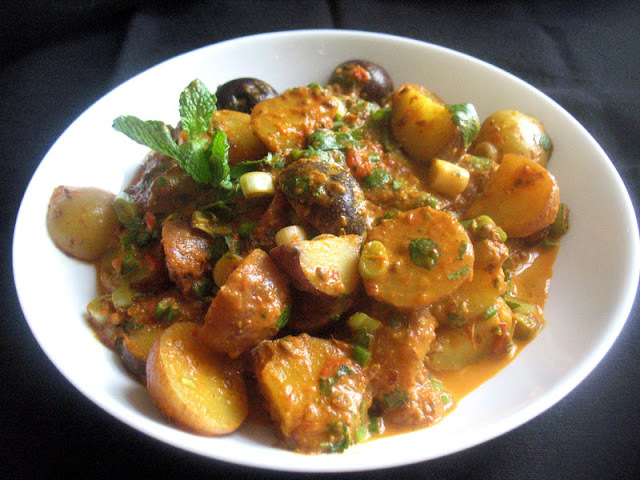 sounds really gud.. the colour and texture seems nice.